I will never, ever look at a duck the same. Or is it just a new species of dogs? Whatever the case, I glued all of them on, so good luck getting them off sucker! so duck face = dog mask face? No wonder you hear a slight bark in a ducks quack. Wait is it a dog wearing a duck mask or a duck wearing a dog mask? Is that a "Kee...something..." character mask? I heard he's very popular recently. That's totally the dog mask off Zelda! That's wrong. Actually, these are dogs wearing duck-costumes. Pewdiepie is at it again. It's a defense against duck hunting, for sure. Retrievers will think they're other dogs. I'm confused, are dogs ducks or are ducks dogs now? Looks more like a fox. A very cunning fox in disguise. That other picture was a mistake. This is the correct version. Finally one that's worded right, and not "dog wearing a mask"
This is what i will think of when i see ducks for now on. are you sure it's not a "dog wearing a mask?????" HEY GUYS QUICK QUESTION. HOW DO YOU TURN OFF CAPS? So it's a cunning fox hiding as a dog inside a fox?! O M G!!! I will never look at ducks the same way! 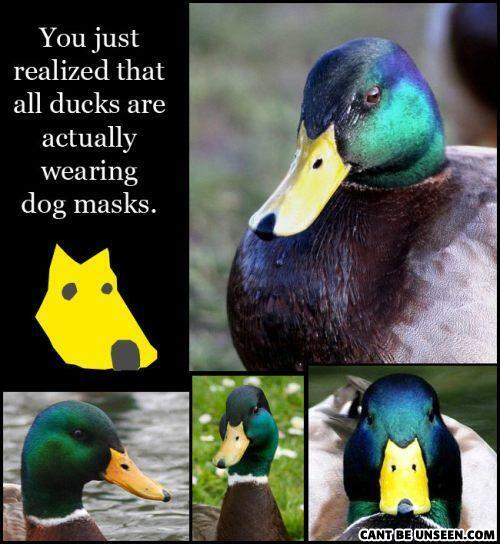 What if ducks make another noise but the dog masks are so long they make it sound like a quack?